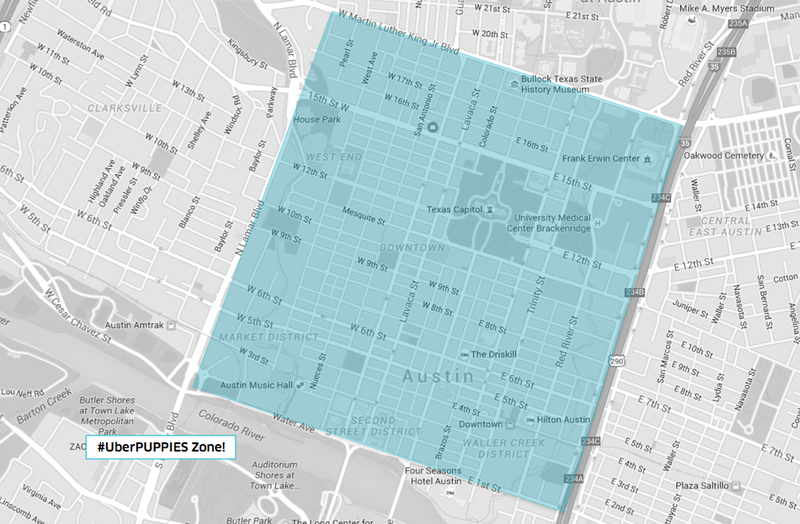 #UberPUPPIES is Coming to Austin! Austin is cooling down and #UberPUPPIES is here to warm your heart. Tomorrow, Friday, November 20, we’re bringing you puppies on demand to raise awareness for rescue animals across Austin. We’ve partnered with Austin Pets Alive! to bring you puppy play dates at the touch of a button. Open your Uber app Friday, November 20 from 11AM to 3PM. Request the “PUPPIES” option in your app. Please note: Puppies can only be delivered to offices. Once the puppies arrive, you and your colleagues will get to enjoy 15 minutes of puppy cuteness! PRO TIP: Make sure to have an enclosed space ready for puppy playtime. *If you’re requesting puppies to your office, please make sure your boss or building is pro-puppy and that no one in the area is allergic. Also, having a dedicated room for puppy playtime is preferred. Found your New Best Friend? All puppies are eligible for adoption — just ask the rep assisting with your puppy delivery! The cost is $30 for 15 minutes of playtime and Uber will in turn support Austin Pets Alive! These cute little canines will be in very high demand and availability will be limited, so please be patient. If you aren’t able to get a puppy visit today, you can still meet them at Austin Pets Alive! Learn more about how delivery driving jobs compare to Uber.